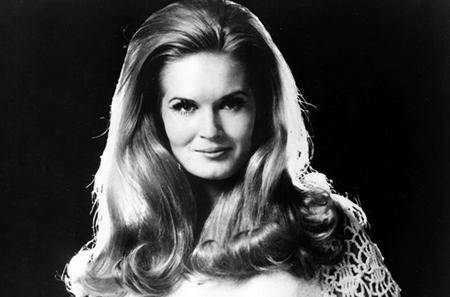 Best known for her Grammy-winning smash "Rose Garden," Lynn Anderson was one of the most popular female country singers of the early '70s, helped by her regular exposure on national television. Anderson was born in Grand Forks, North Dakota, and grew up in Sacramento, California; her mother Liz was a professional songwriter best known for penning Merle Haggard's early hits "(All My Friends Are Gonna Be) Strangers" and "The Fugitive" (the latter with her husband, Carey). Naturally, Lynn picked up music too, and performed as a singer and guitarist during her teen years. 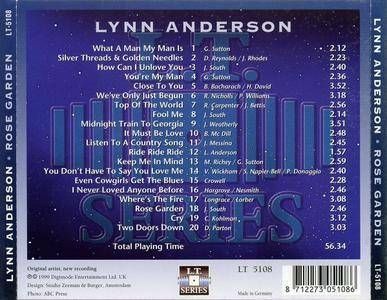 In the mid-'60s, her mother got a recording contract of her own based on her demo tapes, some of which featured Lynn singing background vocals. When the two traveled to Nashville, Lynn wound up recording for the small Chart label, cutting a duet with Jerry Lane as her first single. Her first solo single was 1966's "In Person," and in 1967 she scored her first Top 40 hit with her mother's composition "Ride, Ride, Ride." She burst into the country Top Five with 1967's "If I Kiss You (Will You Go Away)," 1968's "Promises, Promises," and 1969's "That's a No No." Her success helped her land a spot as a weekly regular on The Lawrence Welk Show for a time, and made her the only country singer of her time to fill such a slot on any TV program. She eventually departed amid objections to singing in stereotypical haywagon settings, but went on to appear on numerous other variety shows. In 1970, Anderson moved to Nashville with her husband, writer/producer Glenn Sutton, and signed with Columbia. She quickly scored the biggest hit of her career with the Joe South-penned "Rose Garden," which topped the country charts and went all the way to number three on the pop side. It won her a Grammy for Best Female Country Vocal, and proved a hit in 15 countries. While Anderson never quite duplicated that crossover phenomenon, she racked up 14 more Top Ten hits on the country charts through 1974, including the number ones "How Can I Unlove You," "You're My Man," "Keep Me in Mind," and "What a Man, My Man Is." Her run of success trailed off somewhat in the latter half of the decade, but she continued to make regular appearances on the charts, and finally returned to the Top Ten with 1979's "Isn't It Always Love." She parted ways with Columbia in 1981, and scored one last Top Ten hit for Permian with 1984's "You're Welcome to Tonight." Other than a single for MCA and an album for Mercury, Anderson was silent for the remainder of the '80s; in 1992, she issued the album Cowboy's Sweetheart on the small Delta label. 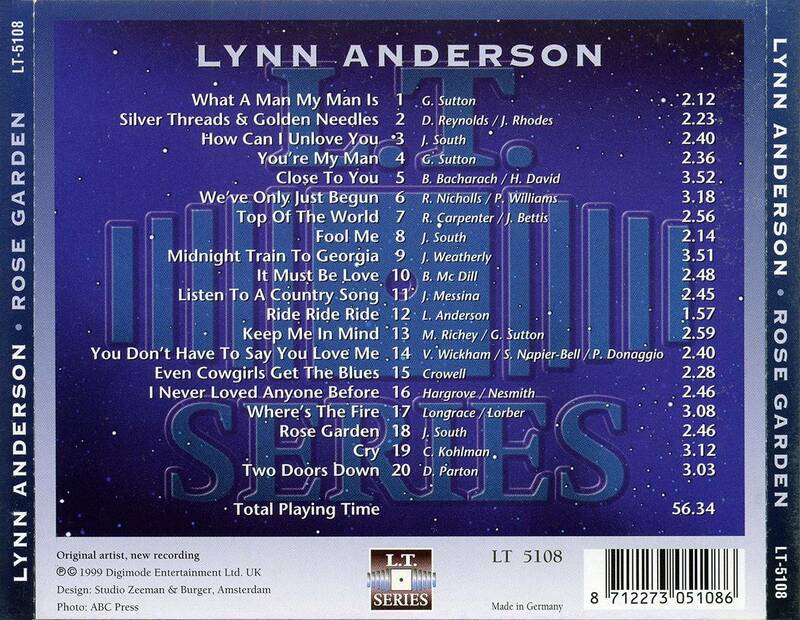 In 2000, Anderson returned with the concert album Live at Billy Bob's Texas. Four years later, she delivered the studio effort The Bluegrass Sessions, which featured bluegrass reworkings of her hits from the '60s and '70s. The album was well-received and garnered a Grammy Award nomination in 2005 for Best Bluegrass Album. 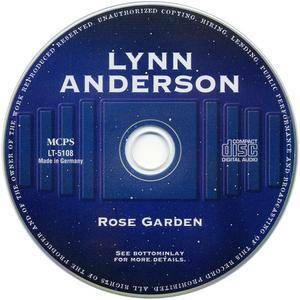 On the heels of her nomination, Anderson appeared at the Grand Ole Opry, duetting with vocalist Martina McBride on her signature hit "Rose Garden." Following her comeback, Anderson kept busy with live appearances including performing at the CMA Music Festival in Nashville in 2007, the Stagecoach Festival in Palm Springs in 2009, and joining the Metropole Symphony Orchestra for a series of shows in 2010 and 2011. In June 2015, Anderson released the album Bridges. 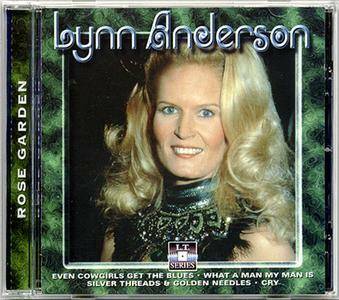 Her first studio recording in over ten years, Bridges featured collaborations with the Oak Ridge Boys and the Martins. On July 30, 2015, Anderson died of a heart attack after having been admitted to a hospital in Nashville suffering from pneumonia. She was 67 years old.